Built on the advent of modern electronics, ECDIS is bringing in a whole new level of performance by transferring all chart work elements onto an electronic display screen. This allows the seamless integration of Electronic Navigational Charts (ENC), GPS position fixing and other navigational tools, including radar, echo sounder, AIS and NAVTEX. Multiple functions are made available with just one click on the computer keyboard, a tap on an icon or the use of a mouse. Suddenly, the supporting tools needed to operate paper charts are history. The additional capabilities of ECDIS are endless, from having reference materials like weather charts and tidal data readily available, to the ability to set pre-warning alarms for navigational hazards and incorporating record-keeping. The system is set to totally change the way navigation is carried out at sea, while making the whole process easier, safer and far more effective. At the same time, any process which can be carried out on a paper chart can also be done on ECDIS. Introduction of new technology does not mean that old skills are irrelevant! Not being aware of back-up procedure when operating in areas where ENC coverage is unavailable. These issues have been addressed by IMO, which has not only set minimum performance standards for ECDIS, but has also formulated guidelines on training. The current version is the 40-hour IMO Model course 1.27 of 2012. These courses are generic by design, and individual administrations should apply them in conjunction with local needs. However, it is important that students demonstrate all the competencies that are listed during the course, rather than just learning about them. expected best practice for organisations, such as OCIMF and, at times, a company’s own SMS. Any onboard familiarisation must be completed before an OOW keeps their first independent watch. This is why many organisations prefer OOWs to complete familiarisation before joining the vessel. The familiarisation stage is especially important, since different manufacturers have different designs and many incorporate features far in excess of those required by IMO standards. Any new system brings with it a new set of challenges. Using ECDIS can easily lull operators into a false sense of security. Too much automation in ECDIS can lead to over-reliance and complacency. Safe navigation is a dynamic activity requiring active situational awareness. According to STCW, “Officers of the navigational watch are responsible for navigating the ship safely during their periods of duty, when they will be particularly concerned with avoiding collision and stranding.” These requirements should always be borne in mind when using ECDIS, along with any other requirements in the company’s SMS. This article is taken from ‘The Navigator’, a free publication from The Nautical Institute. 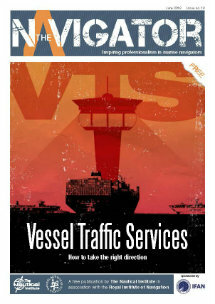 This magazine, and others in the series, can be downloaded at http://www.nautinst.org/thenavigator. The Nautical Institute is an international representative body for maritime professionals, a non-governmental organisation (NGO) with consultative status at the International Maritime Organisation (IMO). The aim of the Nautical Institute is to represent seafarers’ and practical maritime professionals’ views at the highest level. Moreover the Nautical Institute provides a wide range of services to enhance the professional standing and knowledge of its members who are drawn from all sectors of the maritime world. « Piracy in West Africa: A New Model (Unfortunately)?